Combat Power is a key criterion to measure if a character is powerful in the game, but high combat power cannot make you unbeatable. Only by making full use of the Soul Stamp system can you beat down all players. Soul Stamp system unlocks after players complete the quest, “Function of Soul Stamp” in the Xeno Quest. Click the Soul Stamp button on the left side of the main interface to open it. 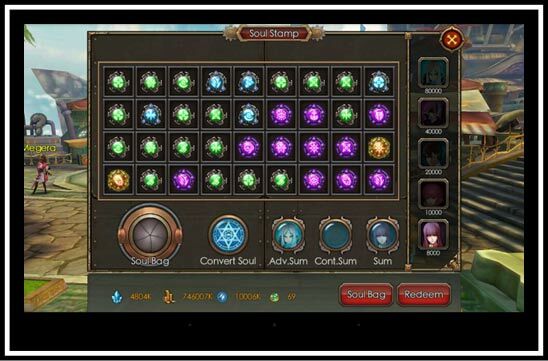 The Soul Stamp system mainly comprises of four functions: Summon Soul Stamp, Convert Soul Force, Soul Stamp Bag and Redeem Soul Stamp. 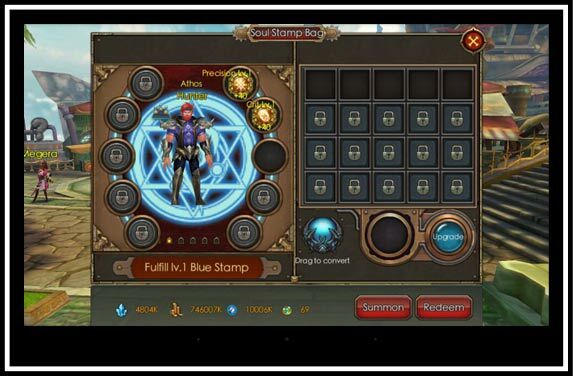 In the Summon Soul Stamp section, there are five summoner levels. Each summoner level requires different fees. The higher level Soul Stamp Summoner requires more Gold and gives the better chance of receiving high quality Soul Stamps. To equip Soul Stamps with characters, simply drag them into the Soul Stamp Bag. Players may equip Soul Stamps to character based on the player’s rank. The higher the rank, the more Soul Stamps a player can equip. However, up to 8 Soul Stamps can be equipped. Apart from putting Soul Stamps into the Soul Stamp Bag, players can also convert them to Soul Forces. Upgrading Soul Stamps requires Soul Forces. The higher the Soul Stamp's level and quality, the better attributes they can offer. During the summoning process, players may receive Soul Quartz that can be directly redeemed for Advanced Soul Stamps.